Since July 2011, heavy monsoon rains in southeast Asia have resulted in catastrophic flooding. In Thailand, about one third of all provinces are affected. On Oct. 23, 2011, when this image from ASTER, the Advanced Spaceborne Thermal Emission and Reflection Radiometer instrument on NASA's Terra spacecraft was acquired, flood waters were approaching the capital city of Bangkok as the Ayutthaya River overflowed its banks. 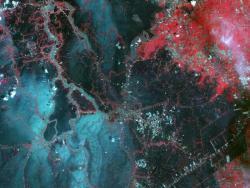 In this image, vegetation is displayed in red, and flooded areas are black and dark blue. Brighter blue shows sediment-laden water, and gray areas are houses, buildings and roads. The image covers an area of 35.2 by 66.3 miles (56.7 by 106.9 kilometers) and is located at 14.5 degrees north latitude, 100.5 degrees east longitude. With its 14 spectral bands from the visible to the thermal infrared wavelength region and its high spatial resolution of 15 to 90 meters (about 50 to 300 feet), ASTER images Earth to map and monitor the changing surface of our planet. ASTER is one of five Earth-observing instruments launched Dec. 18, 1999, on Terra. The instrument was built by Japan's Ministry of Economy, Trade and Industry. A joint U.S./Japan science team is responsible for validation and calibration of the instrument and data products. The broad spectral coverage and high spectral resolution of ASTER provides scientists in numerous disciplines with critical information for surface mapping and monitoring of dynamic conditions and temporal change. Mississippi River Levee in Baton Rouge, LA, taken May 11th 2011.: Panorama of the Mississippi River levee in Baton Rouge, LA near Louisiana State University, taken May 11th 2011.Courtesy Azure BevingtonYou might have heard about the terrible flooding that is occurring all along the Mighty Mississippi. As I write this I am sitting in Baton Rouge, Louisiana hoping the levees will hold. Normally the river in Baton Rouge is far below the tops of the levees. 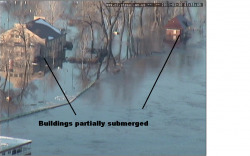 Flood stage, which is the water level at which the river would begin to flood surrounding areas without the levees acting as barriers, is 35 ft. 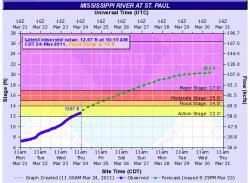 Right now the water level is 42.8 ft and has risen 8 ft in just the last week. It is projected to crest at 47.5 ft and remain at that level for 8 to 10 days; this is higher than the previous record set in May 1927 of 47.28 ft. The tops of the levees that protect Baton Rouge are between 47 and 50 ft, they are currently sandbagging in areas less than 48 ft. Besides the possibility of overtopping there are also other problems that we need to look out for. When the river level remains high for an extended period of time the water can seep in and begin to saturate the soil, this can possibly weaken the levee structure. There is also the possibility of water going under the levee; this can result in sand boils, where the water bubbles up through the soil. It is very unlikely that this will happen, as the levees are strong and well constructed, but we need to be on the lookout for any problems. Here in Baton Rouge we are much better off than many who live in communities within the Atchafalaya Basin, where the expected opening of the Morganza spillway could cause flooding of over 3 million acres (Click here to see a map of projected flooding in the basin) Many of these folks have already begun to sandbag their homes and to prepare to leave the area. The Morganza spillway is a large controlled gated structure that will divert water from the Mississippi River into the Atchafalaya Basin. The Atchafalaya Basin is a low lying cypress swamp that normally receives 30% of the flow of the Mississippi River through the Old River Control structure through the Atchafalaya River that winds its way through the swamp. This flood is projected to be larger than the 1973 flood and possibly even larger than the 1927 flood that devastated communities along the river, and brought about the passage of Flood Control Act of 1928. The magnitude of this year’s flood has already resulted in the opening of the Bonnet Carré spillway which diverts water into Lake Pontchartrain, this reduces the water levels as the River flows past New Orleans. Stay tuned for updates on the flooding in Louisiana. Have any of you been affected by the flood waters? Sometime tonight the US Army Corps of Engineers will blow up a levee at the confluence of the Mississippi and Ohio Rivers. "...ordered the intentional breach to alleviate pressure in the river system and to protect Cairo, even though it may lead to the flooding of 130,000 acres of mostly farmland in Missouri." Arachnophobes beware! The rest of you will love this. Last week, National Geographic published some stinkin' fantastic photos of trees cocooned in spider webs. Apparently high flood waters in Pakistan caused the web-spinning critters to scurry to high, dry land -- namely these trees. "The giant spider webs in Sindh, Pakistan, sometimes stretched from tree to tree..."
"...scientists determined that dozens of spider species were spinning the communal webs." "The huge webs ultimately killed many of the trees they covered, perhaps by reducing the amount of sunlight reaching their leaves. But for a while, the webs also seemed to help trap more mosquitoes in the region, thereby reducing the risk of malaria..."
"While unusual, trees cocooned in spider webs are not unprecedented. Scientists have reported similar webs in other parts of the world, the tropics in particular."